The press conference for the landing and launching of Shaanxi Kuntech Flexible Semiconductor Service Manufacturing Base Project was grandly held in West Fengxi New City, West Xian Xin New District, Shaanxi province on the morning of October 16, with its theme being "Shinning Shaanxi and Shaping the Future World". A number of Chinese government leaders, partners from home and abroad, as well as the media attended the event, where the duo direction foldable AMOLED display with internal and external folds developed by the R&D team was also displayed. Tianme had an large booth in SID, showcasing many display technologies and demonstrating its latest LCD and OLED panels. Tianma started producing rigid and flexible OLEDS in April 2017 at the company's 6-Gen fab in Wuhan, and at SID the company demonstrated its 5.5" on-cell rigid AMOLEDs now in production. Tianma told us that this display was adopted in smartphones by Lenovo and Asus. Tianma also demonstrated several flexible OLEDs in many configurations which we will list below. Almost all of the panels were based on the same basic display - a flexible 5.99" WQHD 1440x2280 (537.5 PPI) AMOLED produced on a polyimide substrate. Tianma showed this panel in a regular design, and also in a notch-type design. 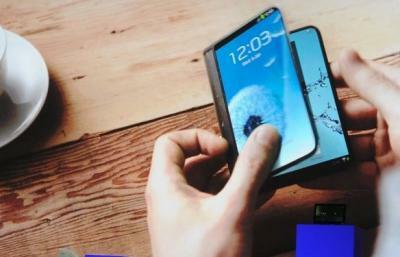 China's Guangzhou New Vision demonstrated its latest flexible and foldable AMOLED displays at SID DisplayWeek. According to the company in the video below, these displays will enter production in 1.5 years. As can be seen in the video, the company is developing flexible OLEDs with a resolution of 400 PPI on oxide-TFT backplanes and Polyimide substrates. New Vision also develops printing technologies (for both OLED and QLED displays, interestingly) - but these are still in an early stage, it seems. 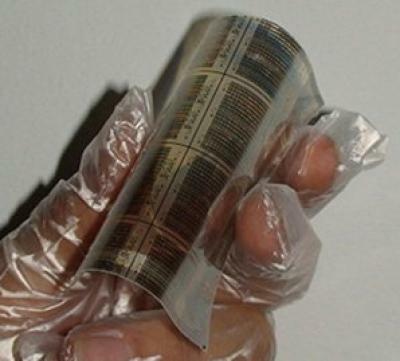 Researchers at Tohoku University in Japan developed a super flexible organic liquid crystal device, which they say are promising for next-generation highly-flexible LCD displays. The new device is formed from ultra-thin plastic (polyimide) substrates that are firmly bonded by polymer wall spacers. The transparent polyimide substrate (made by Mitsui Chemicals) are about 10 um thick each, and feature heat resistance and the ability to form fine pixel structures, including transparent electrodes and color filters. The refractive index anisotropy is extremely small, making wide viewing angles and high contrast ratio possible. Japan's Screen Holdings (previously Dainippon Screen Mfg), a manufacturing equipment maker, announced that it started producing mass-production systems for OLED deposition - and began supplying these to display makers in April. Screen Holdings is already making OLED deposition systems, but only R&D tools. 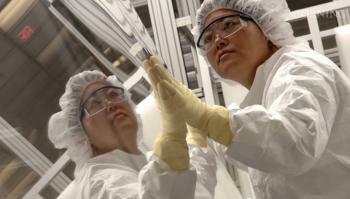 The company finished the development of 6-Gen tools that can coat on polyimide substrate - for flexible OLED production. According to reports, Samsung is gearing up to introduce their first foldable OLED smartphone device by the end of 2016, as Samsung's mobile phone unit is under pressure to innovate and recapture its lost market share. According to an interesting report from Korea, Samsung has been collaborating with a KAIST spin-off called Solip Technology that developed a foldable glass that will be used in Samsung's upcoming foldable OLEDs. Samsung is considering placing a strategic investment in Solip as this material is a key technology for Samsung. Samsung hosted an investors forum in NY a few days ago, and it is reported that much of Samsung's focus was on OLED technologies. 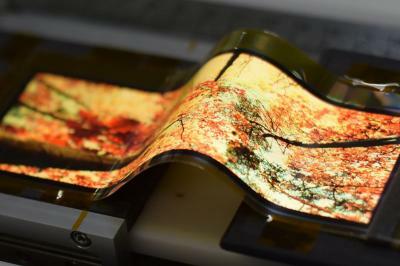 As we already reported, Samsung Electronics announced that flexible OLED is one of its 3 areas of future growth (especially as they struggle to increase high-end mobile phone sales), and during the conference the company revealed some interesting information and prototypes. So first up were two new foldable OLED prototypes - a 5.5" (WQXGA, 2048x1526, 464 PPI) panel that folds in half and a 10" tri-foldable AMOLED (Full-HD, 218 PPI).